What’s more convenient than eating right next to where you cook? 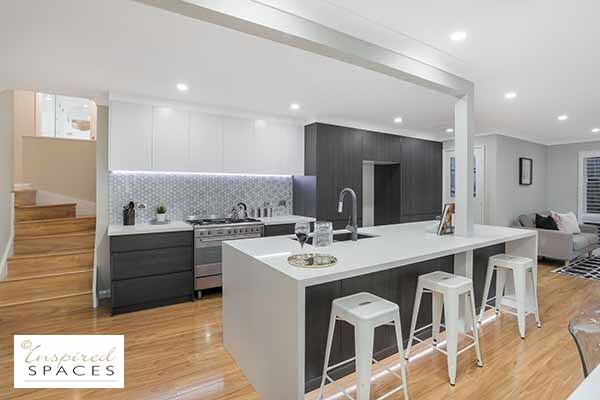 Family and friends naturally gather in the kitchen, it’s the heart of the home, so an eat-in kitchen provides cooks and diners with a casual, social environment while doubling as additional food prep areas. It is multi-tasking at its best! 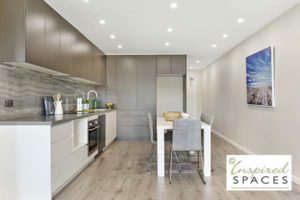 There are many different design options to include dining into your kitchen space, whether it be open plan with a table and chairs or even just a breakfast nook area, there are ideas to suit everyone’s needs. Banquette seating can be created in a nice cosy corner or along a wall with a nice window, or even integrally designed into the back of an island. Comfort is a must, so by using upholstered built-in bench seats will not only provide the comfort of restaurant seating but will also be a great space saver along with providing hidden storage space. Adding a few scatter cushions to your kitchen banquette will make it extra comfy as well as adding a splash of colour. If you have the space, adding a couple of chairs will provide extra seating for guests. Tables can be built-in or square, or even a little round tulip table can work well too. This design can require a larger amount of space but works well for families with children. It can be placed in the centre of your kitchen, or off to a side. Having your dining table and chairs in the kitchen makes it a multi-tasking room for the whole family. Apart from making it easy to get the food to the table quickly, the dining table can be used as additional work space or even as a homework spot for the children after school. Depending on where the table and chairs are placed, you can add a big rug underneath and hang a pendant light or two above the table, these will define the dining area of your eat-in kitchen nicely and provide effective lighting where it’s needed. A kitchen island is the perfect perch for guests to sit and socialise with the cook or for kids that want to help in the kitchen. Dining can be on the island itself for a quick casual dinner or an extension can be added. There are a couple of options for an island extension, they can be either slightly higher to ‘bar’ height or slightly lower to ‘dining’ height. Both ways can be designed to keep them integral with the island itself. Upholstered chairs can be added to create a cosy dining spot. Or some small backless stools can be used for areas where there is not a lot of extra space as they can be easily tucked under the counter when not in use. Kitchens are full of hard surfaces, so by using upholstered furniture, rugs and cushions where you can will reduce the sound and create a more pleasant place for conversation. These things can also be easily changed and updated to add colour and texture to your space. Click here to take a look at a kitchen makeover we designed in Beaumont Hills.